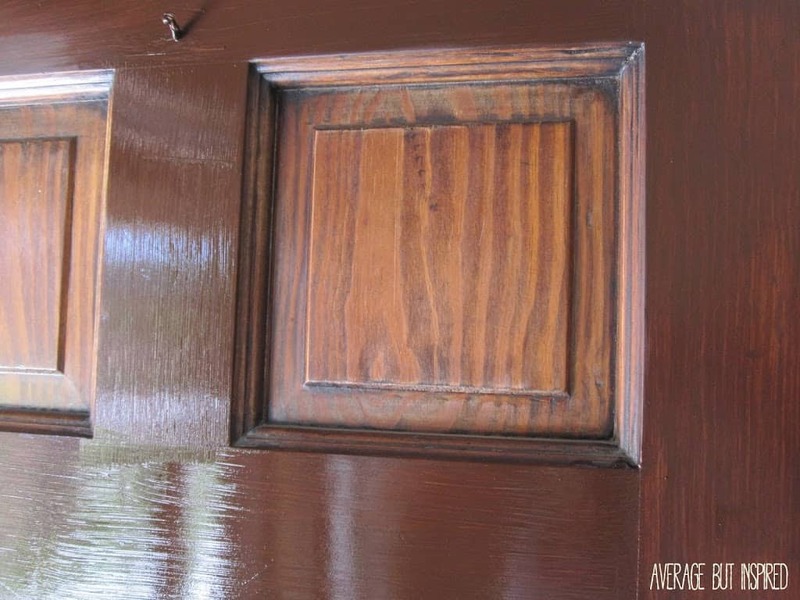 You might think that a post about refinishing a door is boring. But I promise that this is not a boring topic. 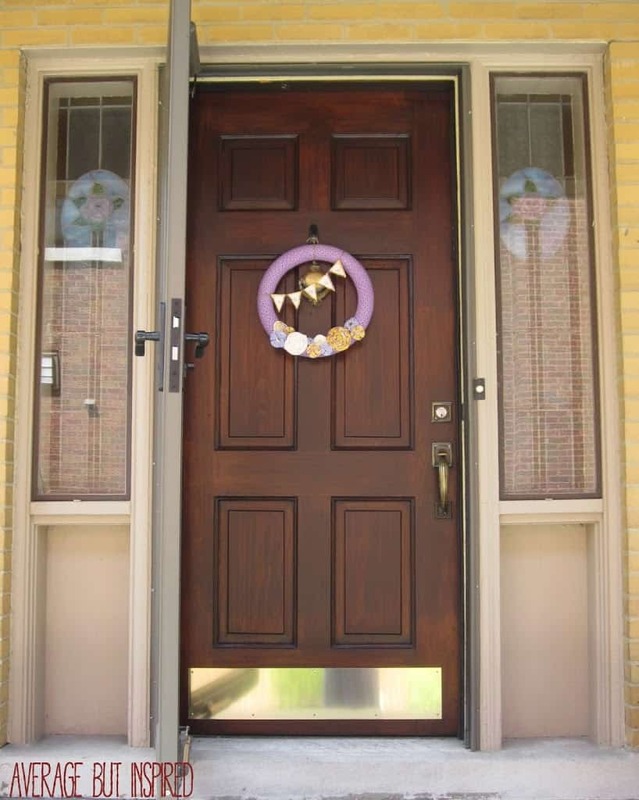 Instead, this post is super exciting and about a product that has changed my life (well, my front door’s life, at least), and made my home’s entrance look amazing! 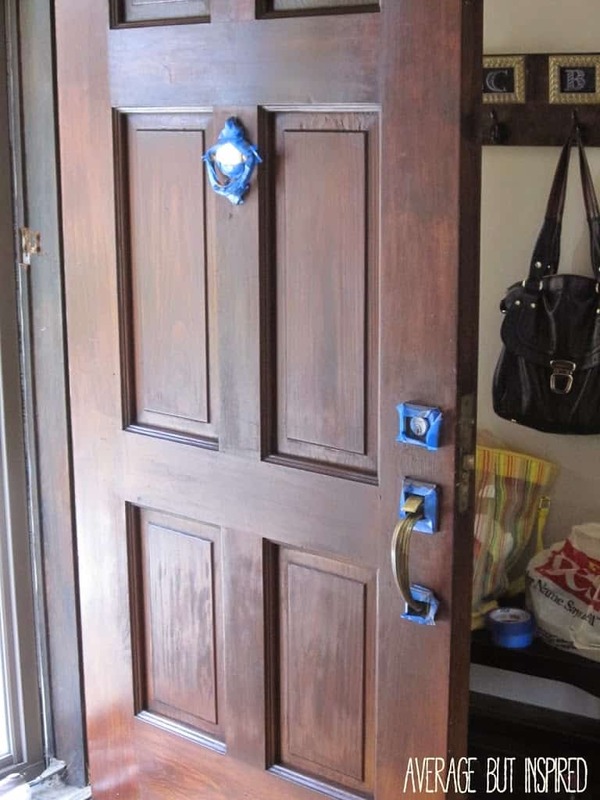 And no, this is not a sponsored post in any way, shape or form – it is simply me sharing my enthusiasm with you because I can’t stop staring at my new, old door! 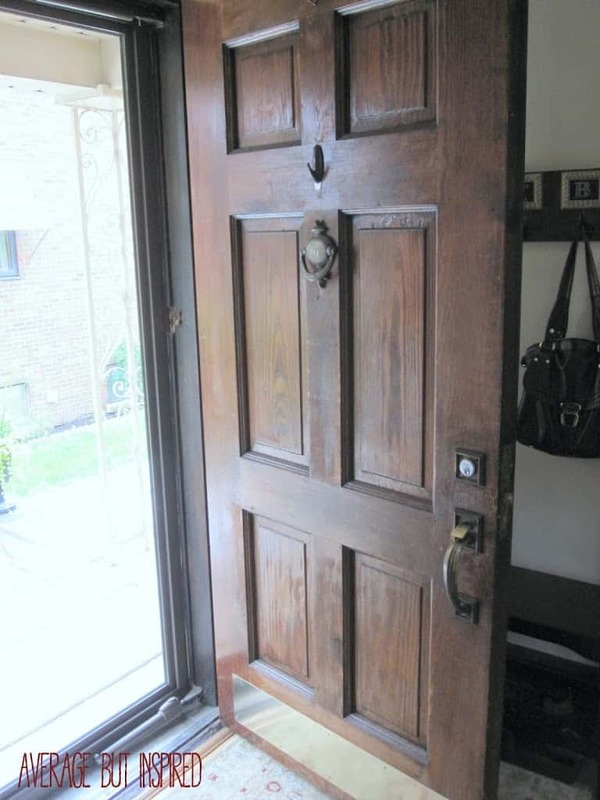 You see, my home had a very sad and neglected mahogany wood front door. My husband and I believe that the door is original to the home (built in 1923), and that it had been unloved since that time. It was dull, scratched, worn and looking like a piece-of-you-know-what. Not a very welcoming entrance to the home that we’ve put so much time and effort into! 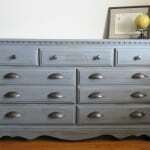 But, after a few days of refinishing it during my kids’ nap time, it is now an asset instead of an eyesore. 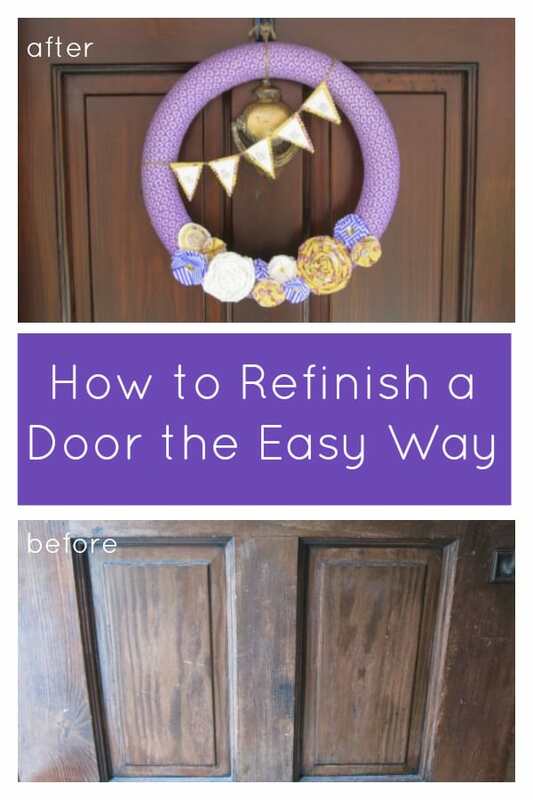 Before we get to the makeover fun, let me tell you that since our door was in such bad shape, we really wanted to replace it with a new, craftsman-style wooden door with windows. But then our roof decided to spring a massive leak and leave us with a huge repair bill. Needless to say, a new door was no longer in the budget. Because of that, I decided to simply paint the door. But then I started feeling guilty about that. I was thinking that Nicole Curtis (The Rehab Addict), might come to my home and beat me down for painting over the original woodwork. 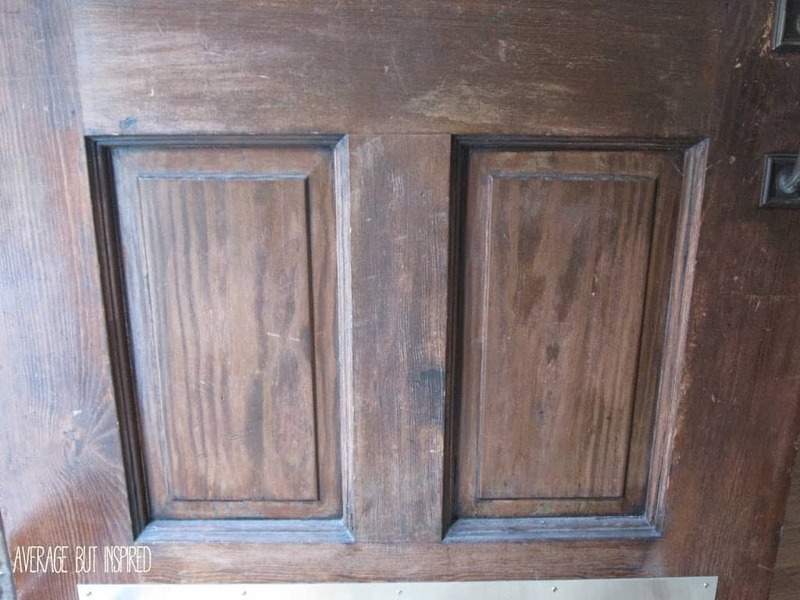 Scared of that tiny but fierce lady, I did some research on how to refinish woodwork the easiest way possible. That’s how I found out about gel stain. This was the KEY to reviving my door. Unlike regular stain, gel stain did not require me to remove the door from the hinges, strip the door or do any extensive prep work at all. The easy way is my way. Sold. General Finishes Gel Stain in Brown Mahogany (Other colors are available here.) 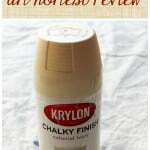 UPDATE: Since publishing this post over three years ago, I have tried other brands of gel stain. In my opinion, none work as well as the General Finishes stain I’ve linked to. I washed the door to remove the dirt and grime that had accumulated over the years. I followed the directions on the can of gel stain, and I applied stain to a small section of the door with a foam brush. I had a temporary freak out when it appeared to be a really dark, solid color – almost like pudding. I thought I’d ruined my door. I used my cheesecloth to wipe off the excess stain on the area to which I’d recently applied the stain. I repeated this process until I finished the entire door. 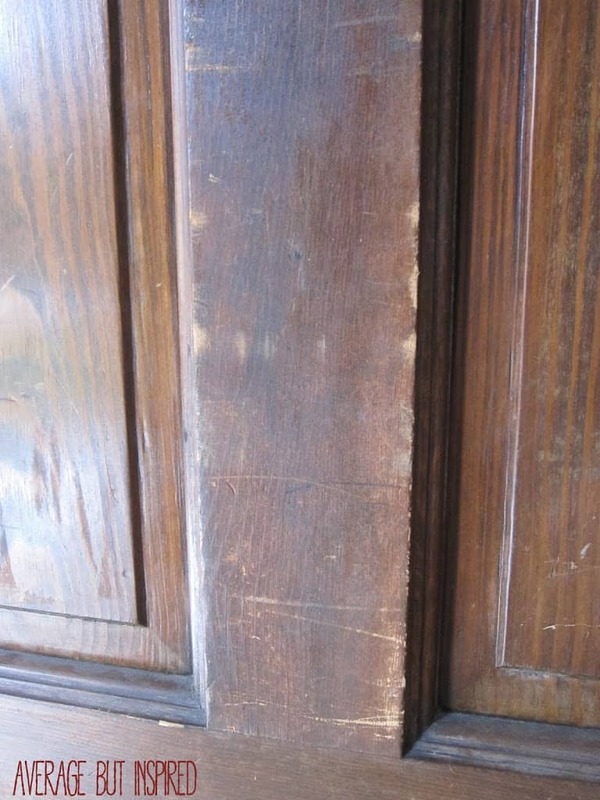 Here you can see that stain had been applied to the right side of the door, but not the left. Look at the difference already! I then let it dry overnight, and repeated the staining process again. This is the door with two coats of stain, but no protective topcoat yet. Already beautiful, right? After the second coat of stain had dried 24 hours, I began applying my protective topcoat, per the manufacturer’s directions. I applied four coats throughout the course of the day, which allowed me to finish the topcoat portion without sanding in between any of the coats. This was key to ensuring ease of application. Can I just say that my door is now GLEAMING? It looks totally amazing – almost like a new door. I couldn’t be happier, and I think Nicole Curtis would be proud. P.S. If you’re a total slob like me and get stain all over your hands during application, rub some vegetable oil on them afterwards – the stain will come off easily and almost instantaneously! FAQ 1: How does your door look now? 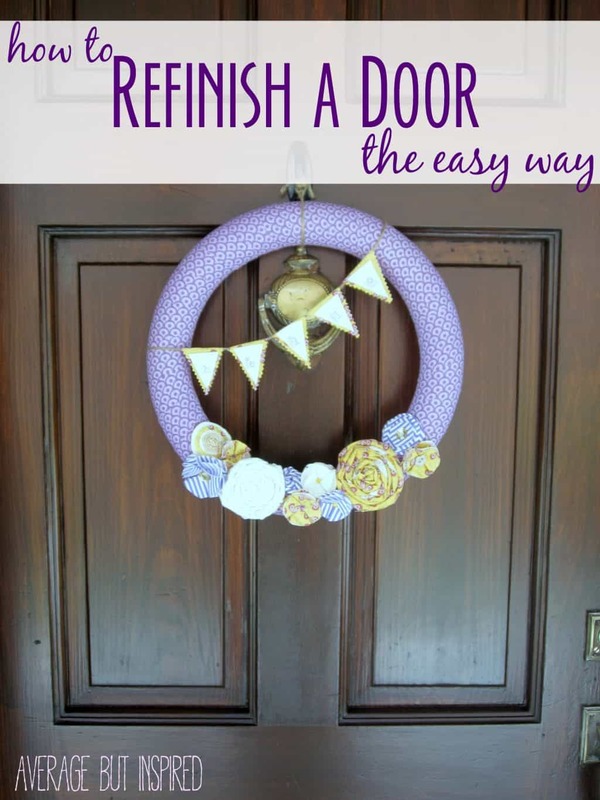 A1: It’s now 2018 (3.5 years after I wrote this post), and I want to tell you that my door still looks FANTASTIC. The only signs of wear are knicks that my family created; nothing to do with the finishes used or the finishing process. This process has stood the test of time and is one I really believe in! 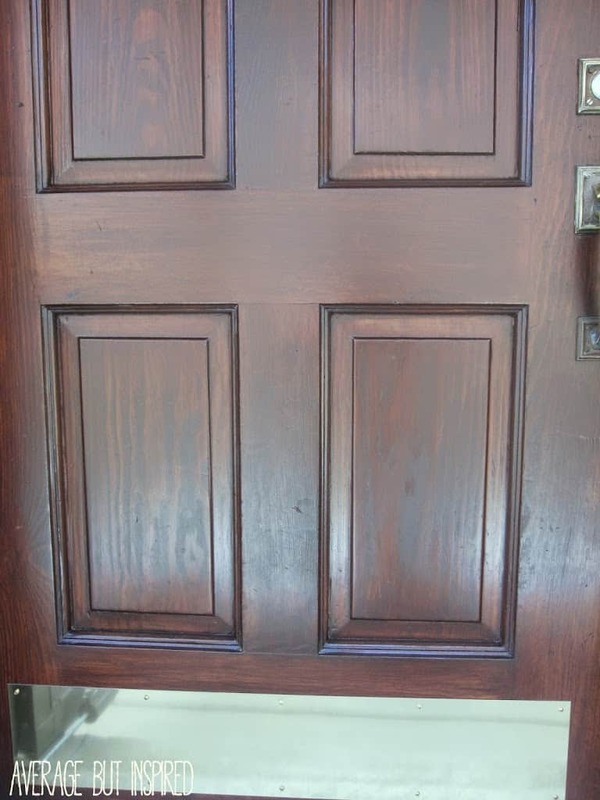 FAQ 2: Are you sure it’s OK to use gel stain on an exterior door? A2: My can of gel stain says nothing about it being for interior use only, though others have told me their cans say that. All I can tell you is that my door has stood up wonderfully! Also, stores that sell the product list it as being safe for interior and exterior use (see Rockler’s page, for example). FAQ 3: Are you sure it’s OK to use a water-based topcoat over the gel stain? A3: Yes! General Finishes says so themselves! Check it out here. FAQ 4: Does gel stain have a strong odor? A4: There is an odor, but it’s not awful or overpowering. 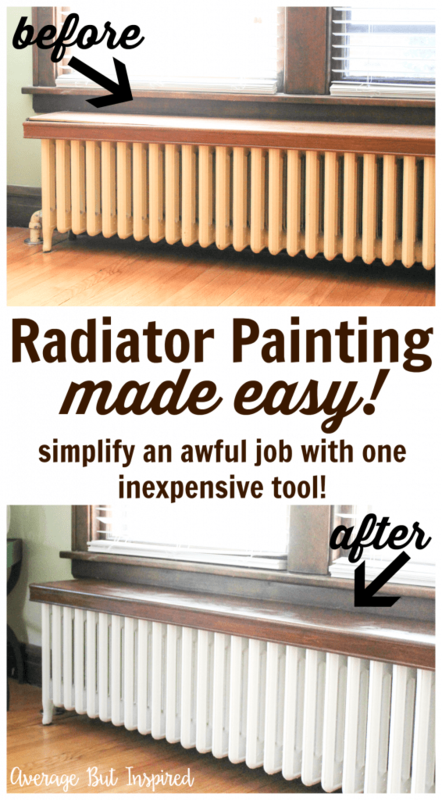 You May Also Like to Learn How to Refinish Your Radiator The Easy Way! Wow, Bre! I looks like a completely new door. I love the color you chose! This is amazing Bre! And I would have been scared of Nicole too, she’s one feisty lady! But I love her 🙂 I’ve seen the gels around but haven’t used them before, so this was super helpful! Does it have a smell to it? Looks great Bre, what a difference some new stain made! I’ve been tempted to use gel stain, I even bought some for a past project and chickened out and went with normal stain, but it sounds like it’s actually very easy to use, thanks for sharing! How beautiful! (And encouraging!) do you remember how many cans of stain you needed for your door? Hi there, how did you allow 24 hour dry time? Leave your door open all night? Been wanting to do my door but am running into this issue. Presume you used water based varnish and not oil based? Where did you buy the metal kickplate item? You did a lovely job with your door. Thank you so much for sharing. I have some areas where the sun has caused the finish to crack on my door. Do you think I can simply sand down the affected areas, or would you recommend my sanding the entire door. I am a little scared about this project, but eager to improve the look of my door. You are so kind to respond so promptly. You are an amazing, inspiring woman. The cracks are actually just in the varnish finish, not the actual wood itself. I was wondering if I could just sand down the areas where the varnish appears to have blistered and cracked. I’m sorry I wasn’t more clear. 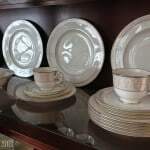 Is you suggest, I can try and find a general finishes dealer, but if you have thoughts on this, I would love to hear them. Thank you again for your time. Is you suggest, I can try and find a general finishes dealer, but if you have thoughts on this, I would love to hear them. Thank you Bre. I appreciate your advice. Your door looks beautiful!! This may be a silly question but did you do both sides or just the front? You are a life saver!! I thought I had ruined my front door, and then I saw your post and tried the gel stain. It looks like new again! Thank you, thank you, thank you!!! I just bought a house and the door is all faded. You can see the wreath imprint from the sun bearing down on the door all day. Would Gel Stain be an ok product to hold up in intense sunshine? My porch is not covered and I don’t have a storm door. How is yours lasting? I wonder if I need a different GF product. I’m dying at the Nicole Curtis comment. I thought I was the only one who played that scenario in my head when considering painting over anything original lol. How has your door finish spans the test of time? It’s been about 3 years since you finished the door. Are you still happy with the results? Thank you for taking the time to share with the rest of us. 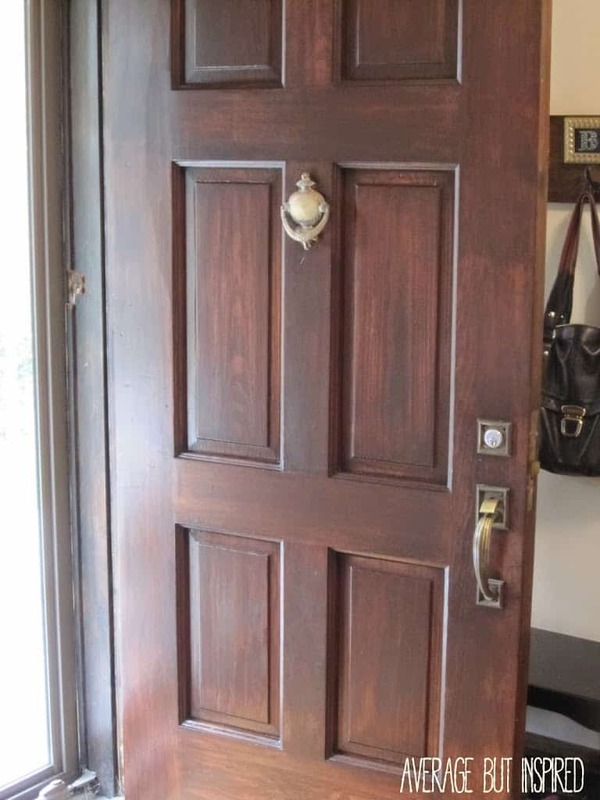 Your article has given me the inspiration I needed to attempt to refinish my own front door. I have a question, is there a reason why you chose to use Rust-Oleum Varathane Clear Water Based Outdoor Spar Urethane over the General Finishes Water Based Exterior 450 Clear Satin as your top coat? I rather use the top coat from the same manufacturer insuring compatability with the Gel stain and hopefully better protection. Love how your door turned out! 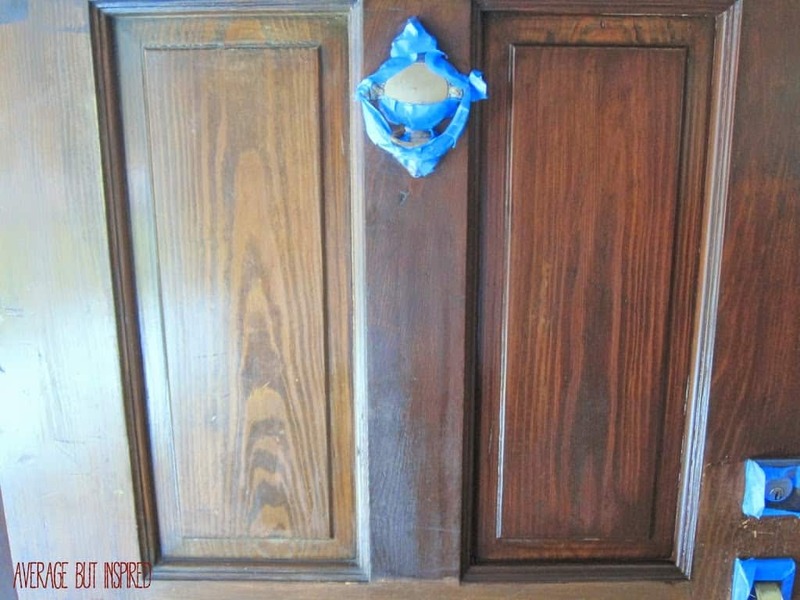 Did you do anything to even out the worn areas of the door before applying the gel stain? Or put an extra coat of gel stain in those areas? I would think that the color difference would show through if you didn’t. We have a banister where the stain has similarly worn off in a few spots, so is love to find out how you dealt with this. Thanks! You used oil base gel stain and then water based spar urethane? Weren’t you worried abt mixing the two? How long did you wait before too coating? Thanks for sharing this! 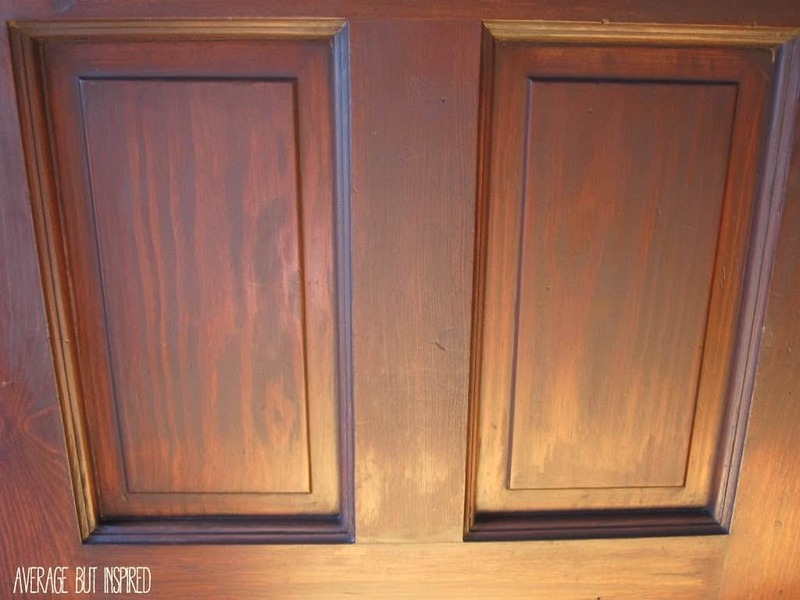 We desperately need to refinish our front door to get our house ready to sell. Did you have to leave the door open while it was drying? We need to do this really soon, but… it’s February (brr!). When you closed the door to dry overnight, did it take off the finish where it touched the door frame / weather stripping? Hi, I am one of those people that plunges headlong into a project regardless of the consequences, so getting such great results was a welcome relief. I am amazed at how accurate your process was. I went from a sad, tired door to one that looks almost new. Keep in mind my front door it probably 20-30 years old. My only issue is the urethane when applied with sponges bubbled and it took a bit of time to correct that issue. Other than that it is “fabulous”. Thank you so much. Thanks for posting this, I was looking for an easy way to do our front door. I received a quote for $325 & thought no way I can do this myself, now I feel even more confident after seeing your post. Can’t believe someone would find the need to say something insulting about your wreath when you were so nice to go thru the trouble of posting this. Thanks again, you just saved me lots of money. 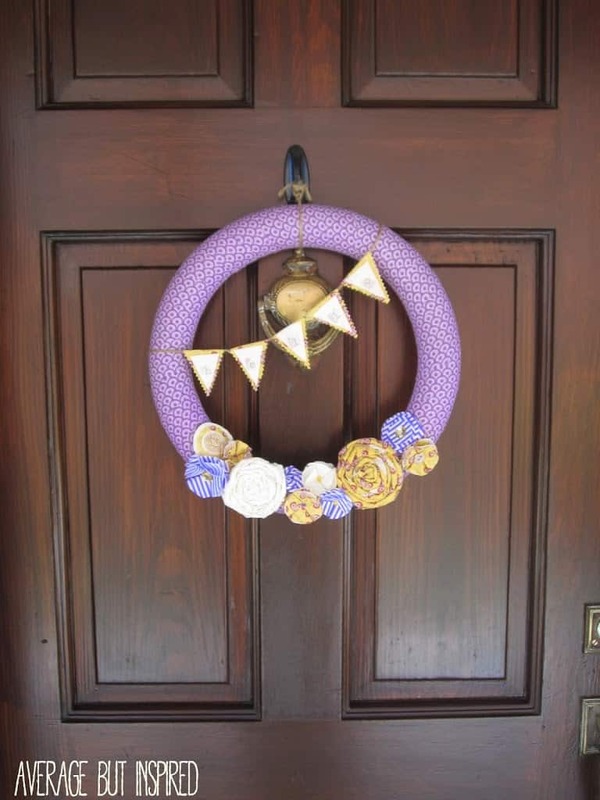 BTW….I think your wreath is adorable. Oh wow, your door looks amazing! I’ve been needing to do our front door for about 2 years, but keep putting it off because I don’t want to take the whole door off the hinges! What did you use to apply the stain and the sealer – a brush? This is awesome…exactly what I was looking for. Was the 1 pint of gel stain enough to do the whole door? Thanks so much for the tutorial!